[dropcap letter=”Y”]ou can tell Golgulsa Temple is different from other Buddhist monasteries in Korea as soon as you arrive. At the main gate are a number of statues of people in various martial arts poses, not unlike a scene from the “Street Fighter” video game. Get here at the right time and you’ll find bald, gray-robed monks flying through the air or practicing high kicks on the cliffs overlooking the temple. No, this is no ordinary worship center. Nestled into a limestone rock face on Mt. Hamwolsan, a sacred mountain in the ancient Silla capital of Gyeongju, Golgulsa Temple is home to Seonmudo, a Buddhist practice that combines Seon (Japanese: Zen) meditation and martial arts. 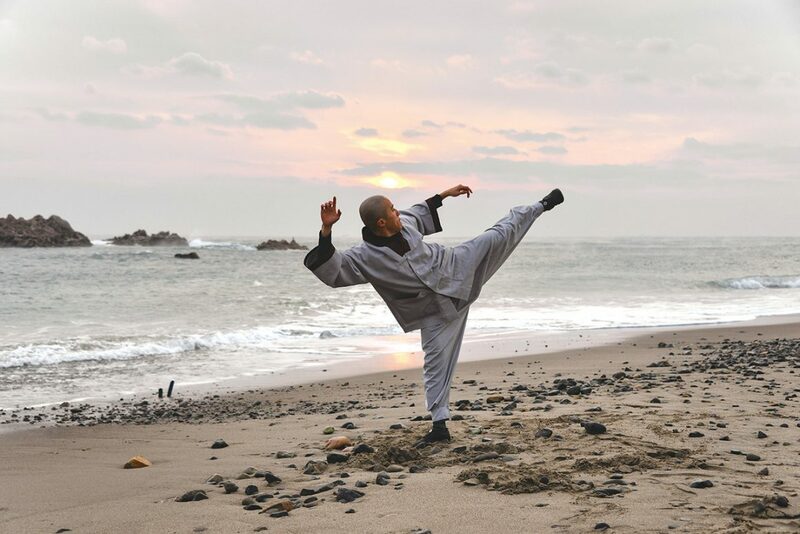 It’s a unique heritage that makes the temple a popular destination for both the spiritually and athletically inclined – comparisons to China’s legendary Shaolin Monastery are not completely unwarranted. Like many temples throughout Korea, Golgulsa Temple has a Templestay program that offers visitors a better appreciation for monastic life and Korea’s 1,700-year-old Buddhist culture. 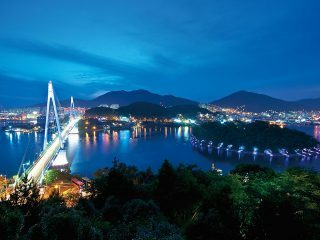 This program also includes demonstrations and practical training in Seonmudo, and though you won’t become a master over a weekend, you will have a singular experience you can’t find anywhere else in the country. 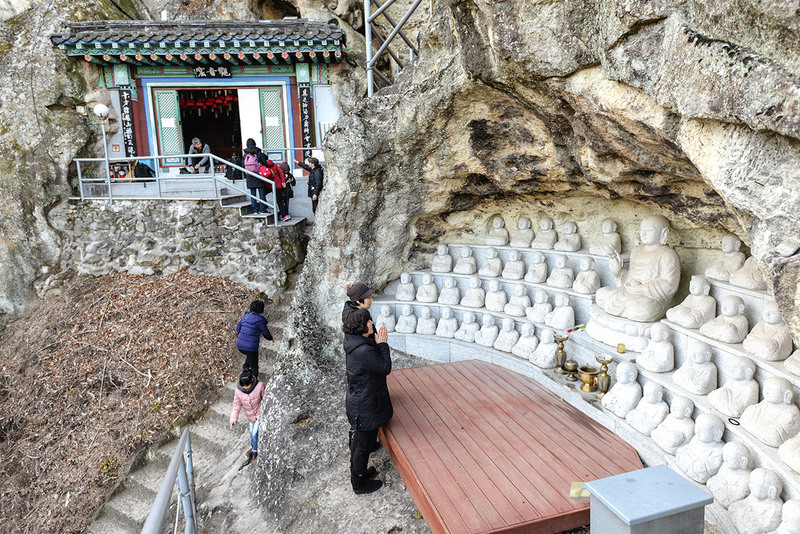 Golgulsa was founded in the sixth century when a party of Indian monks established a humble temple in a cave on Mt. Hamwolsan, patterning their hermitage after those in their homeland. This was a full 200 years prior to the establishment of nearby Bulguksa Temple, Korea’s best-known monastery and a UNESCO World Heritage Site. 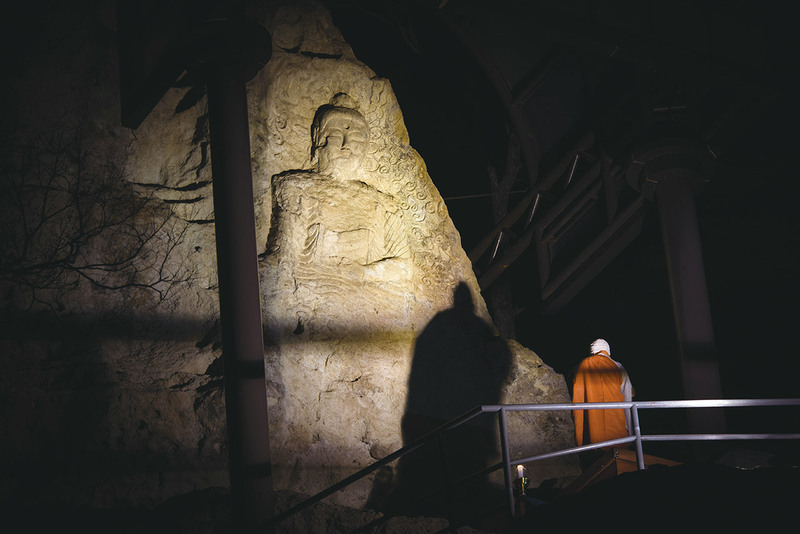 Because of the dramatic mountainside location, many people from the area insist the name of the temple means “Stone Buddha Temple,” and to be sure, there is a 1,500-year-old engraving of the Tathagata Amitabha Buddha etched at the top of the rocky outcropping. In spite of this coincidence, however, the temple’s name actually means “Skull Cave Temple,” owing to the cliff’s twelve caves being said to resemble the eye sockets of a human skull. The steep rock face – a pockmarked, phantasmagoric facade that wouldn’t look out of place in Gaudi’s Barcelona – and its caves still lend the temple a strong aura of supernatural power. Today, seven of the cliff’s 12 caves are used as prayer halls; at one time, all 12 were used as sanctuaries. To reach the caves you must make use of somewhat harrowing staircase, so be sure to keep the guard rails close by at all times. The largest of the cave sanctuaries is Gwaneumgul, a shrine dedicated to Avalokitesvara, the bodhisattva of compassion and mercy. Enshrined among the little niches in the rock wall are 108 bronze figurines of the beloved deity. Locals claim that sick people who spend the night here recover their vitality – the limestone, they say, radiates an energy that’s good for the body. At some time during the Silla Period (57 B.C.-A.D. 935), the monks at Golgulsa Temple began practicing a meditative martial art known as Seonmudo, which means “Seon Martial Way.” Over time, the practice developed into a way to integrate the mind, body and spirit. A type of moving meditation, the purpose of the art is to find harmony among four elements – mediation, yoga, QiGong and martial arts – and use this process to further one’s spiritual development. Practitioners attempt to purify and harmonize the three parts of karma (body, speech and thought) and thus enter into perfect spiritual concentration, or, as the Buddhists call it, samadhi. Buddhism may be a religion of peace, but at times of national crisis, Korea’s Buddhist monks have taken up arms to protect the nation from foreign invasion. The most notable example of this took place during the Imjin War (1592-1598) when the renowned Buddhist monk Seosan, already well into his 70s, recruited and led a band of some 5,000 warrior monks against invading Japanese forces. The soldier-monks turned out to be some of Korea’s most effective fighters in the war, proving instrumental in finally driving out the invaders. After an 18th-century forest fire left Golgulsa Temple in ruins, it remained forgotten about until 1990, when it was rebuilt by Ven. Jeog Un. He is currently head abbot of the temple, having established himself as a grand master of Seonmudo who played an important role in modernizing the discipline in the 1980s. In addition to the temple itself, Golgulsa Temple is home to a Seonmudo training center and a youth leadership training program. 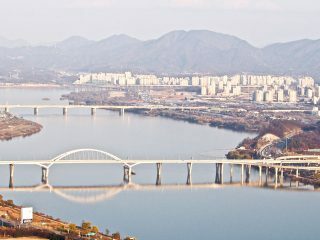 GO> From Gyeongju, take bus No. 100 or 150, just next to the intercity bus terminal. It takes about 40 minutes to get to the stop closest to the temple. Once you get off the bus, you’ll have to walk for about 10 minutes to get to the temple. A taxi from Gyeongju to the temple is about KRW 40,000. The Templestay program at Golgulsa includes basic training in Sunmudo martial arts.